"The data accessed simply helps us to tailor improved experiences to our users, and build new and personalized products for the future,” Spotify said in a comment. “Recent new features include Spotify Running, which matches the BPM of your music to the pace of your run, or the new Discover Weekly feature, which curates a weekly playlist based on your tastes." "Throughout, the privacy and security of our customers’ data is – and will remain – Spotify’s highest priority." Spotify says it will offer a way to opt out of this tracking. 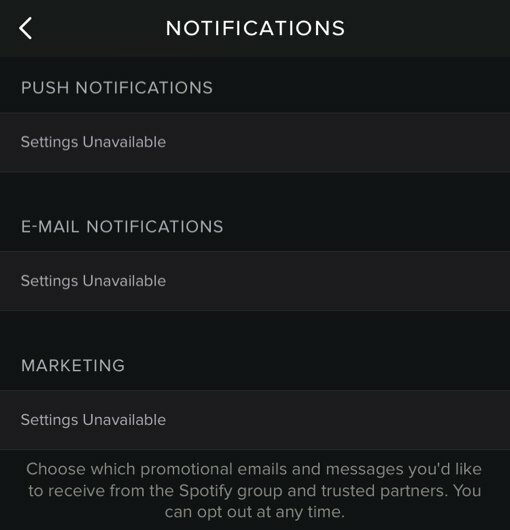 It’s unclear exactly how you do so however – my attempts to change my Marketing settings on the Spotify mobile app were met with a “Settings Unavailable” error message.